But that’s the whole point of asking – hearing that you had a boring weekend validates the other person’s just as unexciting weekend. And you did improv, that’s exciting. Comedy improv, I assume? I always kind of wanted to try that – at least for longer than a few minutes. I like mayo and you too. What’s the big deal? So, question: setting aside your (very correct) point that inane convo about mundane modern living is infuriating; is it possible that we’re missing a bigger point? Such as, perhaps it isn’t the hope of living vicariously through others that we ask these questions; but more to just enjoy the pleasure other people get from their own lives. We’re all stuck in some fairly safe, weekend ruts (it’s spring, all weekends will include mowing until November), but we can be content in our rutness; and we can spread that contentment to others. Perhaps it’s a type of respect to ask about the weekend even knowing the response ahead of time. Just taking the time to acknowledge existence, to give our fellow humans just a moment of consideration, is a plus in a society that cheers when people die on TV. 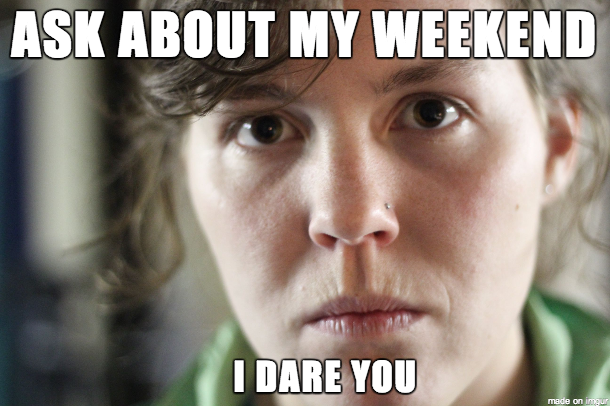 I thought you might say something about how people at work ask you about your weekend but completely forget all details within minutes. For me at least, when my coworkers don’t listen, I cut them off from the cool details of my life. I would like to know about PB oatmeal. When is it typically added and how much (though there is no such thing as too much) I will also assume that you use crunchy, for texture. I still like mayo. Bring out the Hellmann’s and bring out the best!